The Caucasian ridge extends for 1500 km from the East to the West, from the Black Sea to the Caspian Sea, and for 180 km from the South to the North. There are 8 fivethousander and more than 100 fourthousander on the Caucasus. The Caucasus Mountains form the physical barrier dividing Europe and Asia, although the whole range lies entirely within the former Soviet Union. The mountain chain separates Russia from the Caucasian region. The Greater Caucasus is generally divided into three parts: West, Central and East Caucasus. West Caucasus lies on the area of Kharachaevo-Cherkessia and the Stavropolski Region, East Caucasus – on the area of Dagestan, Northern Ossetia, Chechnia and Ingoushetia. 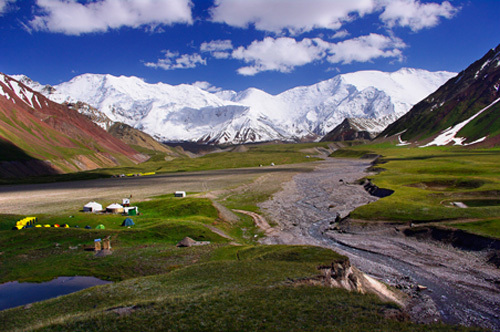 The highest and most glaciated part of the Caucasus is the central region, which includes Mt. Elbrus (5642 m), the highest summit in Europe. Central Caucasus lies on the area of the two Russian republics, Northern Ossetia and Kabardino-Balkaria. This fantastic and very peaceful region attracts climbers from all over the world and gives them a chance to explore the wonders of Caucasus. The central valley along which flows the river Baksan has many side valleys, leading to the most famous and beautiful peaks of the Caucasus, such as Donguz-Orun (4492 m), magnificent ridges of Shkhelda (4300 m), Tchatyn (4368 m), the legendary Ushba (4710 m) and of course Mt. Elbrus (5642 m). The higher altitudes are extensively glaciated. 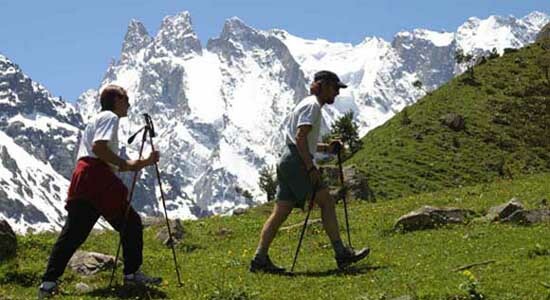 Most passes lie 2400-3000 m above sea level and are crossed only by mountaineering routes. In 1919 the area round the Elbrus was declared to the National Park “Prielbrusie”. The Prielbrusie region is known for its unpredictable weather, which has ruined the hopes and even claimed the lives of many climbers. Mt. Elbrus creates its own weather. There can be serious storms on the mountain, while the next valley is in bright sunshine. 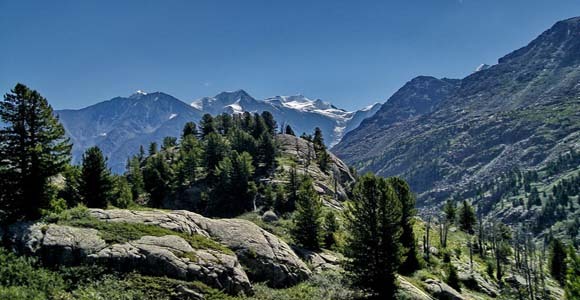 Spring and summer weather here is mainly dry warm and clear (the average monthly valley temperature in July is about 20°C); winter and autumn are cold, dry and clear (the average temperature in January is -4°C). Warm, dry winds blowing from the mountains down into the valleys in winter may cause thaws lasting several days which are often followed by huge snowfalls. Snowfall is frequent and heavy, high in the mountains snowstorms are common. Below 2000 m winter lasts from December to February, above 2000 m from October to April. By the end of the winter season snow-cover reaches 30-60 cm in exposed areas and 3 m in areas protected from the wind. The Elbrus Region (Prielbrusie) is the name often given to a section of the Caucasus extending from the western foothills of Mt. Elbrus to the Chegem Valley in the east. It includes the highest massif of the Caucasus Range - Elbrus (5642 m) - and those parts of the Main Caucasus watershed and side ridges that form the upper Baksan river catchment area. Mt. 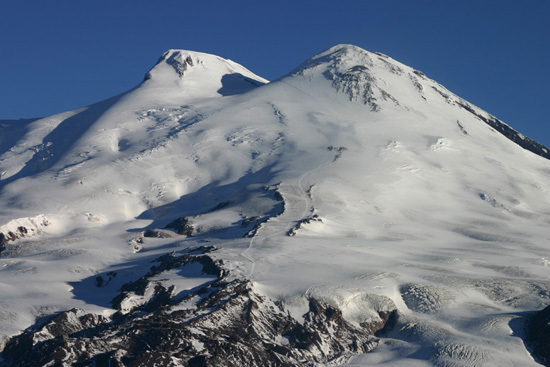 Elbrus is the two-headed cone of a dormant volcano. The west summit is 5642 m high; the eastern one is 5621 m. For the climber with moderate skills, the highest mountain on the European continent has great appeal. 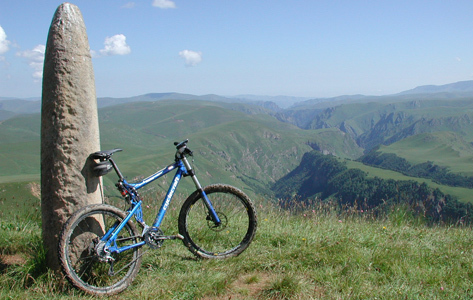 It presents both a strenuous and highly rewarding climb. 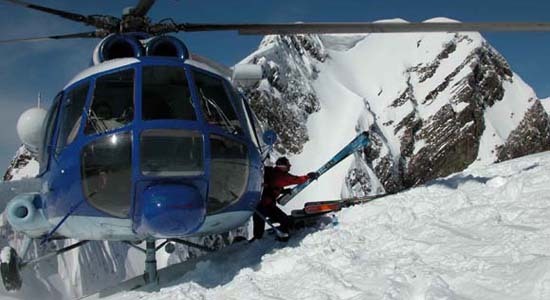 Most of the slopes (up to a height of 4000 m) are not steep; lower slopes reach up to 35° but are interspersed with many rock bands (some 600-700 m high), crevasses, and ice falls on the southern, northern and western slopes. At 3750m the “Barrels” hut is located. It is easily reached by using the cable car and chair lift system up to the Garabashi station; above that it is possible to hire a snow cat to get to the “Priyut” hut (4100 m) and “Diesel” hut (4050 m). 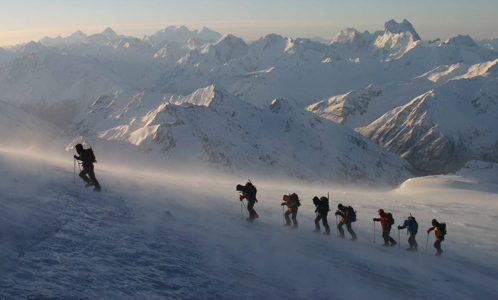 The ascent of Elbrus is technically not difficult but requires the use of crampons over short sections never over 40°C. 10-12 hours ascend from the “Barrels” hut and rapid weather deterioration can make route very difficult and the conditions arctic. 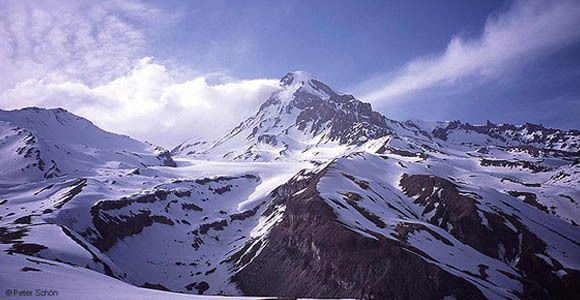 The lower East summit of Elbrus, 5621 m, was first climbed by the Kabardinian native Killar Khashirov in 1829 who was at the time employed as a guide by a Russian army scientific expedition. Killar Kashirov accompanied the expedition consisting of soldiers of the general Emmanuel, hero of the Patric war of 1812.The expedition was backed by the Russian Academy of Sciences. The west, slightly higher summit, 5642 m, was only ascended in 1874 by a Balkarian guide, Akhia Sottajev together with three English climbers: Gardner, Grove and Walker and a Swiss climber Knubel.